The concept of the cycle as a mobility aid is taken more seriously in some places than others. Graffiti aside, this sign outside a library in Denmark is the best icon I’ve seen to represent the cultural chasm running down the middle of the North Sea. I challenge anyone to post a picture of an equivalent sign denoting disabled cycle parking in the UK. Thanks to Cycle Chic blogger, photographer and style guru Mikeal Coalville-Anderson for bringing this to our attention. You can read more about danish mobility aids here in his daily record of life in and around Copenhagen. Compare that with this story of everyday life in our own cycling capital, where Ann Wright was prevented from cycling considerately along London’s South Bank by a PCSO. 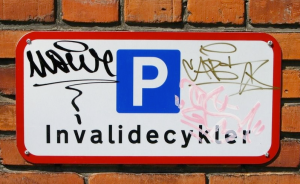 This entry was posted in Inclusive Cycling Forum and tagged bikes, copenhagen, danish, disability, infrastructure, law, london, mobility, politics, wfw, words on Tue 1 Feb 2011 by kevin hickman.